The Wood & Douglas (2013) commission report: Whitewash or coverup? As I write this the fuss about our Frontiers article, “What about Building 7?” A social psychological study of online discussion of 9/11 conspiracy theories, has mostly died down, so now seems like a good time to do a bit of a postmortem and take a look at some of the issues that have come up since the whole ruckus kicked off with Kevin Barrett’s awful PressTV article and its infinite copy-pastes around the blogspamosphere. I’ve been contacted for a couple of interviews since this whole business started: a Google Hangouts interview with the Renegade Variety Hour, and an audio podcast interview with Greg Moffitt of Legalise Freedom. These two shows come from quite different perspectives – Renegade Variety Hour was very conventionalist while Legalise Freedom had more of a conspiracist slant to it – so it was an interesting experience and I was glad to have the opportunity to correct some of the misconceptions that have been circulating around. I was also invited to be on Coast to Coast AM, but that got pushed back so it might not happen. We’ll see. On the whole it’s been a pretty interesting two weeks. There’s a bit more to talk about, including a new counter-rebuttal from Barrett, below the fold. The findings really do show that conventionalists are more hostile and less open-minded than conspiracists, so what’s the problem? I’ll just deal with these points very briefly because there’s more important stuff to get to. First, I talk about the hostility finding a few paragraphs down – briefly, the comments were more hostile, but there’s reason to believe this doesn’t generalise to the commenters themselves, and there’s actually some evidence the other way on this one. Second, I didn’t mention open-mindedness anywhere in the paper; that’s Barrett’s own interpretation of a finding that could equally be taken a different way. If these were the only misinterpretations that Barrett had made it’d be no big deal and I probably wouldn’t have even taken the time to reply. The issue was the “conspiracists are more sane” claim, which has no basis in the research and which is conspicuously missing from the new article. I guess that was a joke? Barrett’s readers took it pretty seriously judging from some of the emails Karen and I got, so as a joke it seems a bit tone-deaf. Third, well, at least he’s not claiming I got a 3AM call from George Soros demanding that I go back on my findings. There’s no profit motive here, because any future employers would probably not take their cues from smear job articles on Iranian state media. I just don’t like people abusing my work to spread self-serving misinformation. Anyway, on to more substantive matters. The idea that the study demonstrates that conspiracists are more “sane” than conventionalists (which some people are still pushing, even though Barrett himself seems to have abandoned it) essentially rests on four major points: that conspiracist comments outnumbered conventionalist comments in our sample; that conspiracists are more likely to take historical context into account; that conventionalists are “fanatically attached” to their own interpretations; and that conventionalists tend to be more hostile. The first point is a non-sequitur and ignores consistent trends in public opinion polls (some of which we cited in the paper) showing that 9/11 conspiracism remains a minority view; the second point is simply false; and the third is baseless self-serving speculation without anything to back it up in the research. This was all spelled out in the previous post so I’m not going to recapitulate it here. The one thing Barrett got mostly right, and which he’s still going on about, was the hostility finding: we did find that conventionalist comments were more hostile on average than conspiracist comments. Some people have looked at this finding and concluded that it constitutes evidence that conspiracists really are more mentally well-adjusted than conventionalists, that the rest of Barrett’s misrepresentations don’t really matter, and, for good measure, that They Got To Me (if you look closely, during the Renegade Variety Hour interview you can see that I’m blinking out SOS in Morse Code with my eyes). The problem with this interpretation lies in extrapolating from “conventionalists are more hostile in these sorts of discussions” to “conventionalists are generally more hostile” and “hostile people are totally cray-cray.” I think a lot of this is a case of people either not reading the paper or just scanning through it to find the bits that support their argument. First and foremost, the explanation we present in the paper for conventionalists being more hostile is that they’re essentially trying to enforce conformity to the majority view – it’s a prediction derived from social influence theory. Essentially, when you have a majority and a minority with conflicting views on some subject, the minority has to be united, civil, and informative in order to effect opinion change in the majority. The majority, on the other hand, has a bit more leeway and doesn’t have to rely on the same tactics in order to convince the minority to abandon its position. People holding the majority position being somewhat more hostile on average in discussions with the minority makes perfect sense in this context – it’s both unnecessary and scientifically irresponsible to conclude on the basis of this kind of discussion that one group is more well-adjusted than the other based entirely on behaviour in this one particular context, because the situation is asymmetrical. In other words, there’s no basis to conclude that the difference in hostility is due to something about the person rather than the situation. Secondly, there’s been some research showing that interpersonal hostility on a dispositional level is positively correlated with attitudes toward the existence of conspiracies. 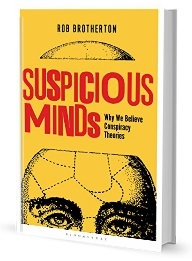 Abalakina-Paap, Stephan, Craig, and Gregory (1999), in a questionnaire study using a well-validated measure of traitlike hostility, showed that the more hostile someone is, the more positive their attitude toward the existence of conspiracies. This difference even persisted when taking into account a range of other relevant psychological variables such as trust, locus of control, and authoritarianism. In other words, when you measure the hostility of people (as a relatively stable personality trait) rather than comments (as captured in the context of an asymmetrical argument in a news website comments section), you get the opposite result. This doesn’t contradict our finding, though, at least not directly, because the two studies asked different questions. Abalakina-Paap et al. looked at the question of whether conspiracism is associated with hostility as a personality trait, while we examined the rhetoric used by conspiracists and conventionalists within a particular, highly specific social situation. There’s an acceptably “sane” range of hostility outside of which conventionalists fall, or some kind of sanity/hostility curve with a downward slope at the point of difference between the two groups. I don’t know anyone who would argue the first point explicitly – most people would probably agree that some baseline level of hostility or aggression or confrontation is necessary to function properly in society, much less in persuasive debate. The second simply has no evidence for it, certainly not from this study. So why are people defending Barrett’s article on the basis of the hostility result? I can’t fault anyone for not knowing about the Abalakina-Paap study, but surely if they were that invested in the hostility finding they could have read the paper and seen the bit about social influence or at least thought through the “more hostile = crazy” reasoning. The fact is, people just like to see themselves complimented and their enemies insulted, and they’ll do whatever rhetorical backflips they need to hang onto that even if the reasoning turns out to have been wrong all along – and that’s pretty much true no matter what they think about 9/11. By the way, you – yes you – you look really nice today. I know you’re maybe not so confident about your hair right at the moment, but it totally suits you. And that shirt? Daaaamn. Looking good. 13 Responses to The Wood & Douglas (2013) commission report: Whitewash or coverup? I think you use a very narrow, artificially constrained definition of “conspiracy theory” that serves a particular purpose, which is not about discovering truth but rather obfuscating and obscuring truth. Furthermore, you invert your narrow conception of “conspiracy theory” in such a way as to imply that people who question the “official narrative” are clinging to a particular belief or world-view, while those who believe the “official narrative” are, by default, the more rational. I think your own study shows the opposite is the case, those who question the “official narrative” have a good reason to do so while those who accept the “official narrative” on faith are the ones clinging to a particular belief or world-view. Your definition of “conspiracy theory” is bizarre and disingenuous. It is not supported by the evidence presented in your study. It is quite clear that most of the people you disparage with the loaded, stereotypical dysphemism, “conspiracy theory”, do not actually promote any particular “conspiracy theory”, not even in the narrow, artificially constrained definition you posit. But obviously, the “official narrative” is a “conspiracy theory”, not matter which way you want to define the term, since 9/11 was not the work of a “lone nut”. Perhaps you don’t realize the term “conspiracy theory” derives from the propaganda used to discredit anyone who questioned the “official narrative” handed down by the Warren Commission. It is still used for the same purpose today, notwithstanding the illogical consequence that the term can be more accurately applied to those who believe the official 9/11 al-Qa’ida conspiracy theory than to those who question it. Perhaps a better definition of “conspiracy theory” for your purposes would be anything that questions or challenges the official narrative, and a “conspiracist” would be anyone who questions, challenges or, presumably, doubts the official narrative on any particular issue. To my mind, therefore, a “conspiracist” equates with someone who can think for themselves and doesn’t necessarily accept every word handed them from some supposed authority. That seems to me to be evidence of intellectual maturity, whereas gullibility and childlike credulity in the face of official pronouncements are signs of innocence and naivety. Cool story, but you don’t get to make up the meanings of words because you aren’t happy with them. They are what they are, and your feeble attempts to misconstrue them, whilst inverting the balance of reason in favour of your own belief system is very amateur. Your entire comment can be simplified to ‘No you’, it’s quite literally that pathetic. The definition issue is definitely a tough one and something I’d like to do a post on in the future. But I do want to briefly reply here to give a sense of why we use the definition we do. In our work we define a conspiracy theory as “a proposed secret plot among powerful people or organisations to achieve sinister ends through deception of the public.” This was intended to capture what most people mean when they say “conspiracy theory” – we’re following the common usage of the term. For most people, a conspiracy theory is not just an allegation that a group of people are conspiring to do something, like a gang planning a bank job. There is always an element of deception whereby powerful people are making the event seem like something it’s not. So there are a few points here. First you bring up a point that a lot of people have come up with as a criticism, which is that “conspiracy theory” just means any theorised conspiracy, because that’s what the words mean. But the phrase is more than the sum of its parts – it doesn’t make sense to reduce it to its components and reverse-engineer the meaning from that. It’s like the phrase “bank job” – you could look at the individual words and say “aha, this means any work involving a bank, so a bank teller is engaging in a bank job every day,” but that’s pedantic frippery. It doesn’t negate the common usage of the term which means a very specific kind of work involving a bank. Conspiracy theory works the same way: the phrase is more than just the words. Second, the phrase “conspiracy theory” predates the Warren Commission by decades. It goes at least as far back as the late 19th century. The idea that it was invented by the CIA or someone similar is not supported by any historical evidence that I’m aware of. Finally, our definition of “conspiracy theory” includes unquestionably real conspiracies like Watergate, Iran-Contra, the “sexing up” of WMD intelligence in the lead-up to the Iraq war, and so on. So it’s not accurate to say that it pathologises people who question official narratives, because there’s nothing pathological about the truth. It’s a class of explanation that some people favour more or less than others, and we find this difference psychologically interesting, which is why we study it. What I’ve noticed in the few people I know that I’d consider conspiracy theorists, is that they are really quick to jump to conclusions. I just found your blog and this is the first article I’ve read. I can’t wait to read the rest as this subject has always interested me. you could also say how easily people who tow the party line refuse to discuss logically evidence presented because all they want to do is defend their positions. ie how did building seven fall, seven hours after the towers? please explain. Fire damage and structural damage, it’s been explained but you seem unable to discuss logically presented evidence that shows this. WTC7 was a classic explosive demolition. Anyone that knows anything about architecture and the structure of steel frame high-rises can understand this. It is the Coincidence Theorists who worship authority who are “really quick to jump to conclusions” those hand fed to them like pablum by the authorities. NIST had to disregard the actual builder’s notes and how the building was actually put together to come up with their bogus ‘first in history’ collapse of a steel framed skyscraper story. I think this is a very good definition of a “conspiracy theory” – when the term ‘theory’ is used in it’s proper technical meaning. It is also so that there are numerous conspiracies that have been proven beyond reasonable doubt throughout history. But there is a deeper perspective here involving systemic analysis, and the conspiratorial nature of a National Security State, wherein policy is decided behind closed doors by agencies designed for covert activities; the Intelligence branches of all major nation states in the modern world. The term was invented and put into wide circulation by the CIA to smear and defame people. A 50-page CIA memo, known as “CIA Dispatch 1035-960,” instructed agents to contact their media contacts and disparage those, like Garrison, criticizing the Warren Commission findings that Lee Harvey Oswald killed JFK and acted alone. The 1967 document is here in the original, and here in reformatted text of its summary. More generally, Operation Mockingbird was the CIA’s secret program to plant stories in the nation’s most prestigious news outlets.